2. In a large flat pan or baking sheet, salt the eggplant slices generously on all sides, toss to coat evenly and hold for 30 minutes to release excess moisture and bitterness. 3. Drain and rinse the eggplant and toss into a large mixing bowl. Add in the tomatoes, zucchini, mushrooms, garlic and onions. Generously drizzle the vegetables with olive oil and season with salt, and pepper, stir to coat. Transfer the vegetables to an ovenproof pan lined with tin foil. Roast the vegetables in the oven for 20 - 25 minutes or until soft, caramelized and fork tender. Stir or flip the vegetables about 10 – 15 minutes into the roasting process to avoid sticking to the pan. Remove the pan from the oven and set aside. 4. Meanwhile, rinse the farro with water and drain in a colander over the sink. Add the farro to a 3-quart (3L) saucepot and add in the Almond Breeze. Season with a pinch of salt and a drizzle of olive oil. Bring the liquid to boil over medium high heat, and then turn down the heat to a low simmer to avoid spilling over. Simmer the farro for 20 minutes with the lid to the pot cocked to one side to let out steam. Turn off the heat but leave the pot on the stovetop and close the lid. Steam in the pot for another 5 minutes or until the farro is soft but slightly chewy in the centre. Remove the lid and fluff with a fork. 5. 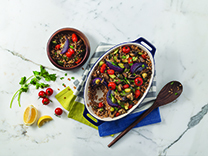 When ready to assemble the dish, combine the cooked farro with the vegetables in a large serving dish and gently toss to mix. Whisk together the olive oil with the balsamic vinegar and drizzle over the farro salad. Toss to coat and season with salt and pepper to taste. Garnish with fresh cilantro and a squeeze of lemon. Serve warm. This dish is great as a main course or as a side to a lean protein. Cooking farro in almond beverage provides an additional nutty flavour that enhances the overall complexity of the dish.